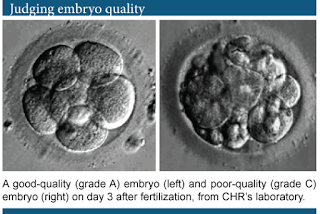 Dr.Malpani's Blog: Is it worth transferring poor quality Day 3 embryos into the uterus? Hello. Thank you for your comment. We just completed our first IVF cycle. From the beginning of the cycle, the RE wanted to do a fresh transfer. Due to a large amount of stress in our current jobs, as well as personal lives, I wanted to delay the transfer for several months. Also, due to my age, I wanted to consider a second round of IVF prior to potentially becoming pregnant, for the sake of banking embryos. On Day 2, I was told that the two embryos were grades A- and B. I was also told to prepare for transfer the next day! The following day, prior to transfer, I talked the RE out of doing the fresh transfer. This RE was not my doctor, but the one that was on call that weekend. When my husband and I explained some of the stress factors in our lives, he agreed that it would best best to wait. 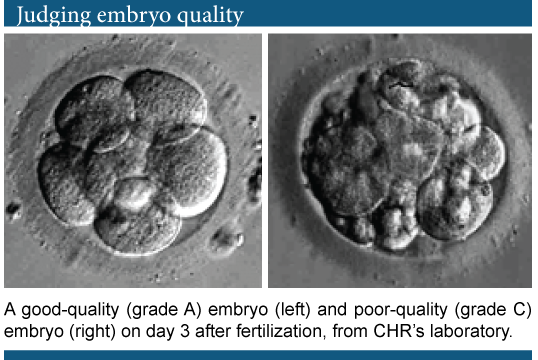 At Day 3, the embryos were a B+ and a B-. I don't know why they didn't try to get them to Day 5, but they are currently frozen at Day 3 for a FET in a few months. Should we have asked them to get them to Day 5, instead of freezing at Day 3? The conclusion of the article also says - Performing blastocyst transfer may have benefits because it is associated with acceptable pregnancy rates and morphologic assessment on day 3 has limited predictive value for subsequent embryonic development. The uterus is not a passive organ. It's a very elegant organ which itself senses the embryo and makes itself ready for implantation and then tells the embryo what to do. It makes sense to not to transfer grade 3 embryos as the uterus has a biosensor. It senses the embryo quality and decides to continue receptivity or terminate in menstruation. Let's not underestimate the uterus. Hello, and thank you for your blog! We just completed our first IVF cycle. From the beginning of the cycle, the RE wanted to do a fresh transfer. Due to a large amount of stress in our current jobs, as well as personal lives, I wanted to delay the transfer for several months. Also, due to my age, I wanted to consider a second round of IVF prior to potentially becoming pregnant, for the sake of banking embryos. How many cells do they have ? You can ask them to thaw them and grow them to Day 5 in the lab before transferring them.